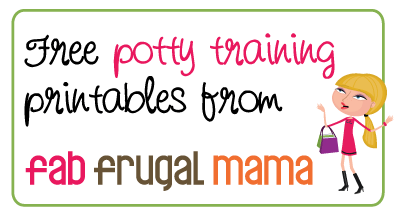 When baby #2 started potty training, I feared that I would get as frustrated as I did with my first child. You see, my oldest went on the potty for the first time at 17 months. It was one of those things where she saw the potty seat I had bought for her (and encouraged her to sit on… just for fun) and decided one day she would like to try it sans diaper. There was much hulabaloo made of this momentous occasion, then it seems that the whole experience went downhill from there. We spent the next 19 months in a frustrating cycle of spending long periods of time in the washroom just singing songs and reading books… but not doing any real business on the toilet. I had started setting the timer for 5 minutes, but my little one would plead, “But, Mama, I really HAVE to GO! Please just a bit longer!”. Fast forward to today and I realize that these were just stalling tactics to have uninterrupted, one-on-one time with me, but at the time, I wanted to give her the benefit of the doubt. What if she really DID have to go? Would I be impeding her progress if I made her get off the potty too quickly? In the end, SHE decided when she wanted to be trained. It’s like a lightbulb went off a few days after her third birthday, and we haven’t looked back since. She’s been great – no accidents whatsoever! So, now that my littlest one is in the midst of potty training, I am taking a much more laid back approach. Unless he tells me he has to go, I don’t push the issue. Occasionally I ask him, but if he doesn’t show interest, I don’t pursue the topic. However, I have created a handy little chart for us to mark his progress. And, although I always said I’d never bribe with food, I have heard so many success stories from my friends who have used Smarties or other favourite treats to inspire potty-going that I’ve decided to try it. (Who am I to argue with success?) So, I’ve included a spot at the end of each row to indicate a treat has been earned. My son is obsessed with construction vehicles, so that’s what I put on his, but I’ve created two versions here for you to choose whichever best suits your little one. Thanks for creating these charts! I love them and we've gone through more than a dozen. 🙂 Thanks for your story, too. My oldest also started training at 17 months. He'll be 3 in September and it's just been a very long potty-training process. I'm taking your approach with my second kid and just waiting longer unless he indicates otherwise. Thank you for this! My daughter (first child) is just 2 months shy of 3 years old, and like your story, she went pee on the potty when she was only 18 months old…but didn't do it again until a month or two ago. I have also heard that leaving them to figure it out when they're ready (rather than try and force it somehow when they're not) is the better, less stressful way to go. I feel she is on the verge of getting it (she's been going pee on the toilet a lot this week (but no poo yet) but still doesn't want to let go of the diapers). I've been giving stickers every time she goes and I think the chart will be a nice way to track her progress.